When shopping for a new dishwasher, you may not realize the difference that a few decibels can make in terms of how loud your dishwasher is when you run a cycle. In fact, a low decibel rating is the most-requested features that people seek in a dishwasher. It makes sense, as nobody wants a loud appliance interrupting their family dinner. A noisy dishwasher isn’t just a nuisance that affects the kitchen, depending on its location it may be a disruptive distraction for many other day-to-day household activities. 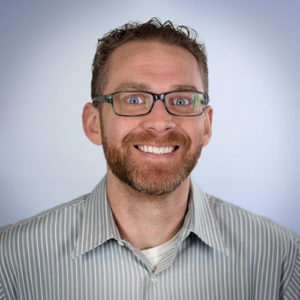 Waking up a sleeping baby or drowning out your favorite TV show are two scenarios that would likely play-out in my house, and depending on the layout of your home, you could probably think of a few situations where a loud dishwasher would be annoying. Before you buy a new dishwasher, let’s take a closer look at what a dishwasher “decibel rating” means and why you should be paying attention to it. 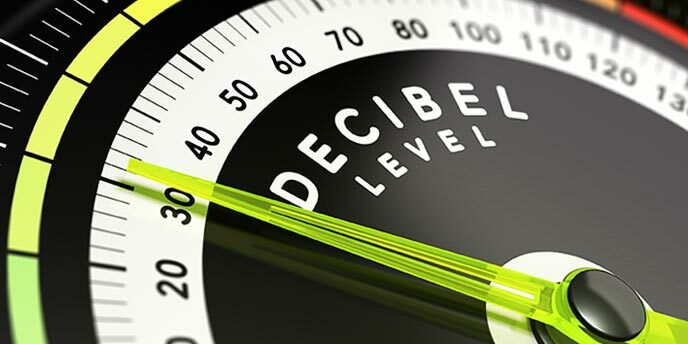 A decibel (dB) is a logarithmic unit that is used to describe levels of sound. Often decibels are measured as dBA units, which filter out higher and lower frequencies to be more representative of the way humans can hear. Using dBA units, sound monitors can accurately reflect what noise frequencies the human ear will be sensitive to. Most dishwashers range from about 46 to 60 decibels. On the surface, this decibel level may not sound like much, but in reality, this is loud enough to interrupt a normal conversation. 50 dB Refrigerator 103 dB Jet Flyover at 1,000 ft.
How Many Decibels Is A Quiet Dishwasher? As you can see, even just one decibel can make a difference. It is important to pay attention to the decibel rating of your dishwasher, because if your model has a dBA high of 60, you’ll likely end up competing with the dishwasher to hear your dinner conversations. 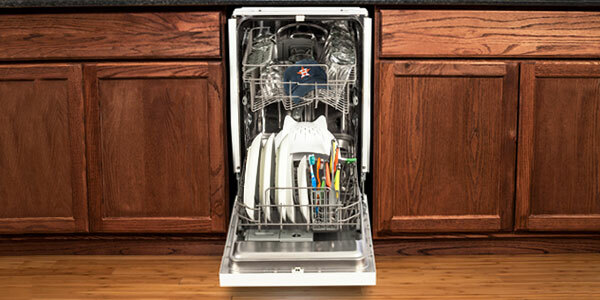 A lower dBA range—around 38 or 40 dBA is considered a silent model—can mean that the dishwasher can run anytime of day or even night without disrupting normal household activities. Many newer model dishwashers, including portable and 18 inch models, even feature an indicator light to alert you that they are washing, because they can be so quiet that you may not even realize that they are running at all. Most manufacturers will provide the decibel rating for their dishwashers. 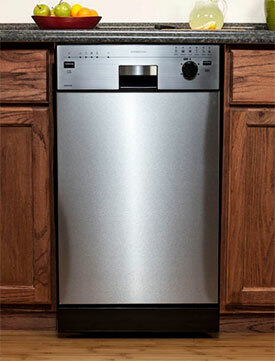 However, below we have listed out the most common factors that can play a role in how loud or quiet your dishwasher is. 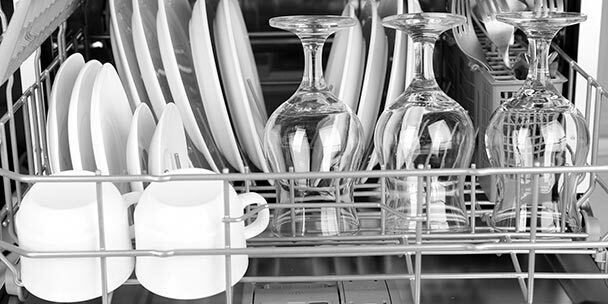 When your dishwasher was built, how it was built, and what materials it was made of all play a role in the sound level it reaches when it is running. Even dishwashers from only 10 years ago are usually louder than newer models; this can be because of materials used, innovations in dishwasher design, and the way houses are currently arranged. With the popularity of open-floor plans growing around the world, manufacturers are forced to consider how loud their dishwashers really are. It’s one thing if you can hear the dishwasher running in the kitchen, but it’s entirely different if you can hear it from across the house. As such, designers are taking this into consideration when designing newer dishwashers, making today’s models quieter to run and less disruptive to the household as a whole. The decibel rating of a dishwasher goes way beyond the design. In fact, the biggest factor in lowering the decibel rating of your dishwasher lies in the quality of materials used within the assembly. Dishwashers contain insulation in the sides and front of the machine, and the higher the quality of the insulation, the lower the decibel rating will be. Likewise, the thicker the insulation is also plays a role in lowering the decibel rating. As an extra benefit, better insulation can also increase the energy efficiency of your machine. 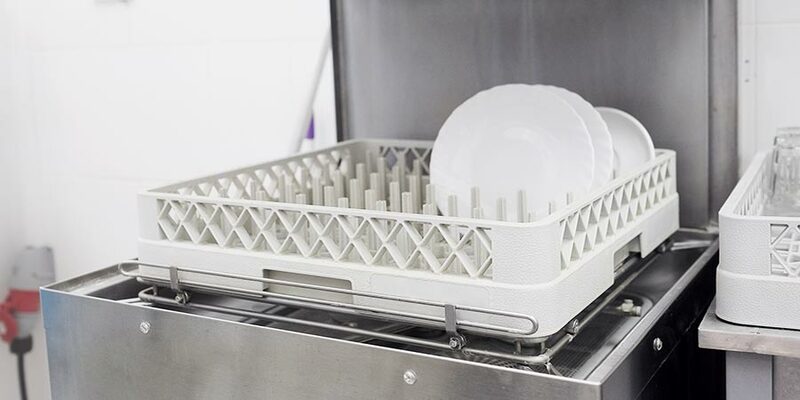 If you already own an older model dishwasher or a machine that is too loud, you can purchase sound-deadening material, similar to insulation, which is wrapped around the top and sides of the dishwasher, helping to reduce the noise and make a quieter kitchen. Dishwashers with stainless steel interiors are a popular choice, and although they can be more expensive upfront, they are much quieter than models with plastic tubs. Stainless steel tubs are more capable of absorbing sounds from the water spraying around inside the unit. On top of this, stainless steel is able to retain heat in as more efficient manner than its plastic counterparts. Not only does this help shorter the drying time, but it also helps you save money on energy costs and keeps the noise going at shorter durations. Stainless steel is also easier to clean, and won’t absorb odors as plastics can. The basic construction of your dishwasher also matters in terms of sound quality. If your machine’s motor is attached to the base of your dishwasher, it is likely to be quieter than models where the pump and motor are attached to the tub. Unfortunately, dishwashers that have the motor built into the base of the unit tend to cost more, as the materials used cost more. 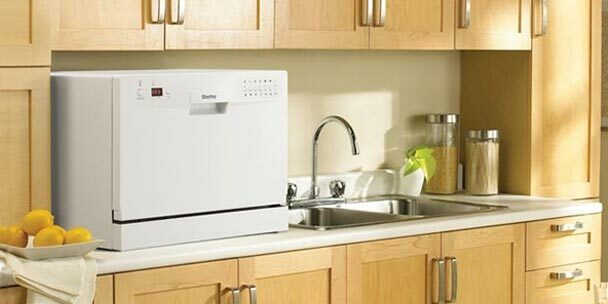 Supplementary convenience features in dishwasher models can also contribute to the overall noise level of the machine. Extra features such as disposal systems, additional spray arms, added jets, and certain dishwasher filters can all make a big difference in the decibel rating of your appliance. Dishwashers that contain a disposal system tend to be louder than those without, as the chopping and pulverizing of food particles will contribute to the noise level it achieves. Additional spray arms and added jets will also create more noise than other models simply because of the extra water shooting around inside of your machine. Certain spray jets are designed to shoot water only at your dishes and are engineered for the water not to reach the sides of the machine, but these specially designed jets also add cost. Dishwasher filters affect noise level as well. 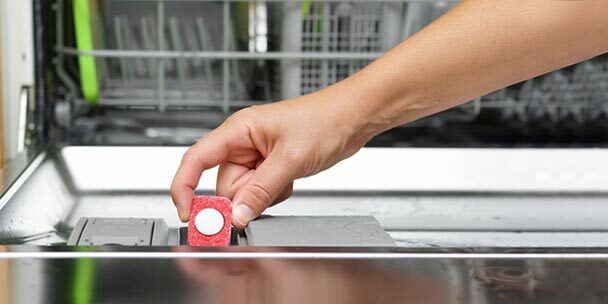 Every dishwasher has a filter that catches food particles and prevents them from attaching to just-washed dishes. If your dishwasher contains a self-cleaning filter, it also contains a motor that will pulverize any food bits and wash them down the drain. You won’t have to clean it yourself, but that extra process will also mean extra noise. Manual filters will have to be cleaned every few months, but they can help reduce the noise level of your machine. 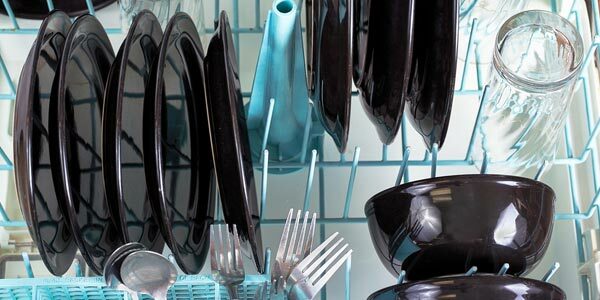 There are many factors that go into how loud or quiet a dishwasher is. Unfortunately, when it comes to buying a dishwasher with the best decibel rating, it seems to be true that you get what you pay for. More expensive models predictably use higher-grade materials, contain better quality insulation, and feature stainless steel interiors that all work together to create a quieter, lower-decibel level dishwasher. I just ran across this article. We bought a new dishwasher January 2016. Noise was my prime concern as the old one some, 30 years old, could be heard all over the house. We settle on a under $400 Whirlpool model that boosted a noise level max of 35 DB. I have a noise meter app on my phone and it indicated that the background noise level in the store was a little under 35 DB when there were no announcements going on. The store seemed quiet to me. When the machine was installed at home I immediately tested it’s noise level. It ran about 32 DB fluctuating somewhat, but never above 35 DB. 16 months of twice a week use, it is still running around 32 DB, and I have not seen it go above 35 DB. My measurements were taken at six inches from the machine and at 3 feet. Of course the further away I was, the lower the noise level. My home with no pets, no kids has 30 to 34 DB of background noise, so the dishwasher may actually be quieter than what I can determine. We cannot generally hear this machine unless we are up close or listening for it. It has a small row of lights that tell us what​ it is doing. When it is finished, there is a 3 to 5 second tone at approximately 50 DB. After searching for quite awhile, I can find no such animal. Whirlpool models are generally 45db or above. Extremely quiet models (under 40db) normally cost over $1000. I have Whirlpool WDT920SADM at 46 decibels and it’s remarkably quiet without paying the premium to go to the silent models. I also want to know what model of dishwasher. What would be a better choice in quality , cost, water usage, and would have a lower water bill, and is an energy star product; a kitchen aid full console dishwasher, 6 cycles, 5 options, including pro wash cycle, satinglide max upper rack , stainless steel tub with heated dry option, and a 48 dba sound level, priced at $629.98, or a frigidair fully intergrated gallery series stainless steel dishwasher with 7 wash cycles with orbitclean spray arm, 53 dba sound level, Saharadry performance priced at $538.98, a Bosch fully intergrated stainless steel dishwasher with 5 wash cycles/5 options, a silence rating of44 dba, flexible 3rd rack for additional loading priced at $809.98, or a beko 18″ fully intergrated stainlesss steel dishwasher , 5 wash cycles/ 5 options, sensor wash with brushless motor, 8 place setting and s stainless steel tub priced st $749.98. This is the first time I’m looking to purchase and have no idea which would be a better choice from these 4 options, and if there is one that you think is better than any if these even if there are other brands that I should look at please let me know where to start. Any advise would be greatly appreciated . These are just a few on sale at PC Richards. Even another store , brand or website that I should look at would be helpful. Also what does re-installation after mail in rebate mean and what dies “excludes benchmark” mean and is that a big issue I should lol out for. Thank you. If you’re still looking i’d go with the LG LDP6797ST. i recently purchased it and couldn’t be happier with it. At 44 db, I can barely hear it running and has plenty of options. Are you still happy with the LG 6797 model? That’s the one I’m considering to purchase. Avoid LG. My sister has one and the main motor assembly has been replaced twice and should be replaced a 3rd time, the first time was under warranty. I replaced the main motor assembly the 2nd time (heater coil melted the plastic housing at bottom, which caused a leak all over the floor). It has since broken again, the heater simply stopped working so everything drip dries now. Any advise or help again would be greatly appreciated because I do suffer from mental illness and have a learning disability as well as have suffered from carbon dioxide poisoning from breathing in fumes from a vehicle I once owned that almost killed me because of how high the level of poison I had ingested while driving that car for over s month; basically after I woke up after being treated with oxygen the doctors told me the damage to my brain was as if I was an alcoholic and had been drinking for 50 years. I used to be considered somewhat of a genius and now I suffer from short and long term memory loss and reading and comprehending what I read. I can’t read books any more or go to school to higher my education because once I read a paragraph to the next, not only can I not remember what I read and have to read the same material over and over, I have a really hard time comprehending and understanding what I just read and can’t even remember . So any help as you can see would make a world of difference , and the simpler the information and answer to my questions the better. Again thank you and have a great day! I have a Bosch and it is extremely quiet. I can hardly hear it run except when it beeps it’s done. Stainless steel tub inside also helps. I have a Bosch and I hate it. The best thing I can say about it is that it is quiet. That’s because it has no soft food disposal. So one must practically wash the dishes before putting them in the dishwasher. Also the running time for a normal wash is 133 minutes. That’s a long time! I’ve complained to the Bosch people about this dishwasher a number of times. Apparently all my complaints have no merit. The cheap plastic spinning water jet arms constantly get clogged with stuff that gets in the dishwasher. I have to use tweezers to remove these little pieces of flotsom and jetsom. The reason I’m looking at this site is that I’m buying a new dishwasher WITH a soft food disposal like my tried and true former Kitchen Aid. No more Bosch EVER. I need to find out what is the dba sound rating of my dishwasher: bosch SHU43C02UC/17. I searched all over but could not find any information. If anyone knows I would appreciate.